John Nunn is a three-time Olympian who competed in race walking at the 2016 Rio Games, the 2012 London Games, and the 2004 Athens Games. At the 2016 Olympics, he placed 43rd in the 50-kilometer race walk with a time of 4:16:12. He competed in the same distance at the 2012 Games (42nd place with 4:03:28). At the 2012 Olympic Trials, he was first with a time of 4:04:41. In the 2004 games he competed in the 20-kilometer race walk where he placed 26th. 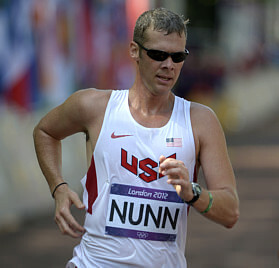 Nunn was born on February 3, 1978. He is a member of The Church of Jesus Christ of Latter-day Saints. He owns a gourmet cookie business with his daughter, Ella, and is a US Army staff sergeant. This page was last edited on 29 December 2016, at 14:58.